No, I did not hit 200 posts and decide to run away. I have just been traveling everywhere this past month as well as taking an online course, thus my posting -- not to mention cooking, has fallen by the wayside. 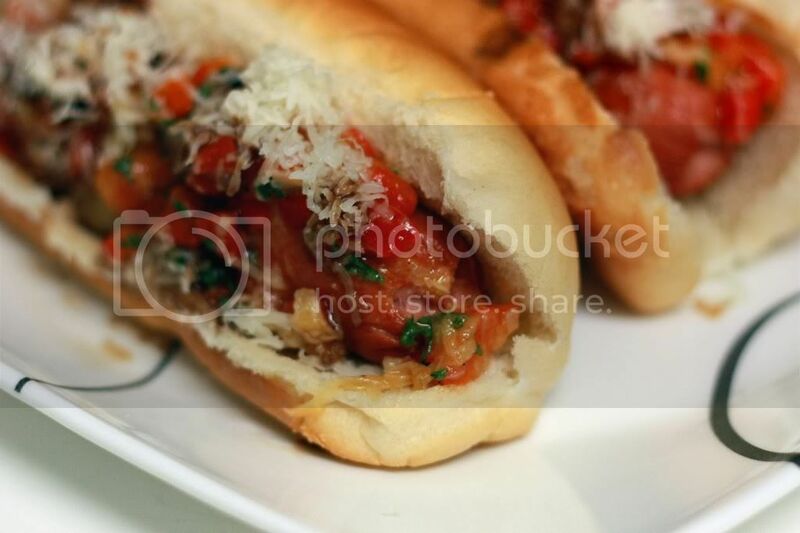 And such as shame too, as these hot dogs are absolutely perfect for summer. I am usually not a huge hot dog fan; I rarely ever eat them (unless I am at a barbecue and it's either that or hamburgers), and I almost never crave them. I ran across this recipe in a Bon Appetit from 2009. Yes, it really took me that long to make these. One day I finally decided to buck up and try them, it is summer after all, and hot dogs are definitely a staple summer food. We had these once way back in May and then again for the 4th of July -- we wanted a little bit of a different spin on the ol' traditional Independence Day meal. And that's exactly what this is; still your same old hot dog, but with a tasty unique relish that sets it apart from your plane jane ketchup and mustand dogs. Preheat oven to 400°F. Place each head of garlic, cut side up, in center of square of foil; drizzle each with 1 teaspoon oil. Enclose garlic in foil. Place packets on oven rack; roast until garlic is tender, about 45 minutes. Open packets; cool 15 minutes. Squeeze garlic cloves into small bowl. Mash enough roasted garlic to measure 1/4 cup (reserve remaining garlic for another use). Transfer 1/4 cup mashed garlic to bowl. Mix in 3 teaspoons oil, red peppers, and parsley. Season with coarse salt and pepper. Arrange buns on plates. 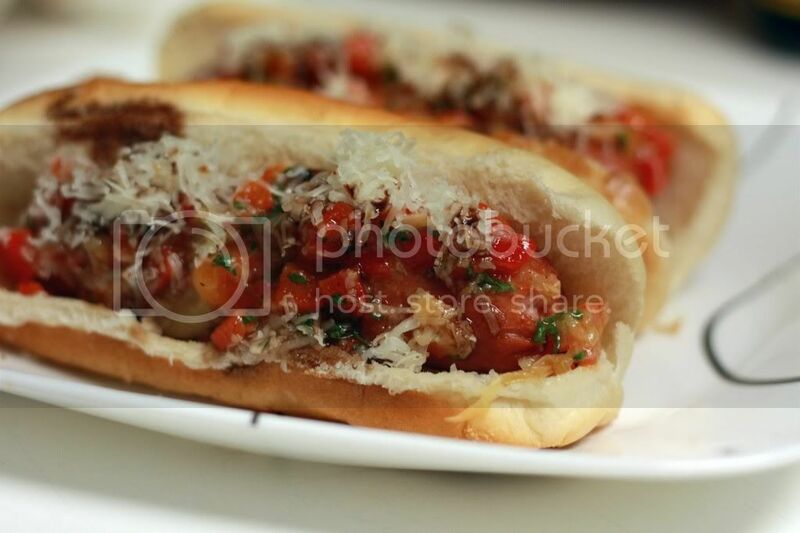 Top each with grilled hot dog, then cheese, garlic relish, and drizzle of vinegar. *Manchego cheese is a sheep's cheese found in the specialty cheese area in your grocery. If you are unable to find it (as we were at my parents') substitute with Monterey Jack cheese. 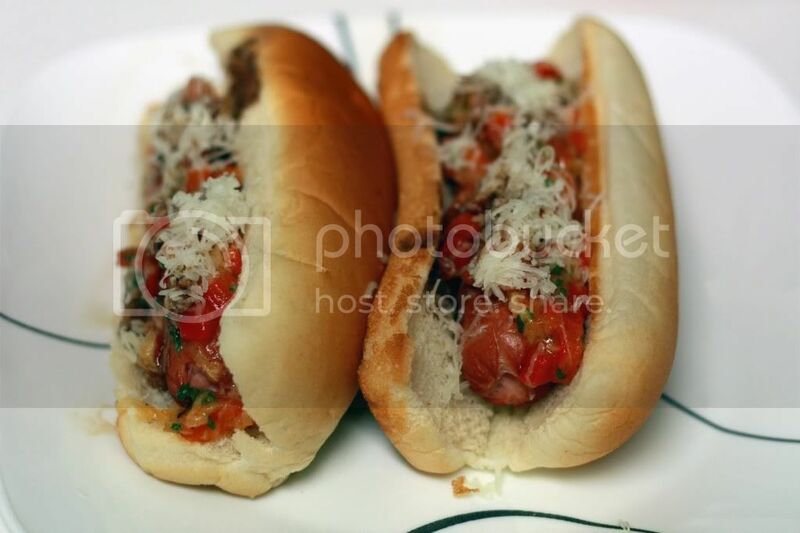 For hot dogs, these were quite tasty, and I really liked how the garlic mellowed out with roasting. It's actually quite easy to throw the relish together, the only real time involved with these is roasting the garlic. The recipe calls for grilled hot dogs, but we've tried them both ways, and I think either works fine -- whatever is your preference. Adam's vote was they were better without the balsamic vinegar, but I liked them with it. Once again, personal preference thing (although they are better with it). And the nice thing about this meal is that if someone there isn't a fan of the relish... there's always ketchup and mustard.